The morning of my 40th birthday..... That's one I'll NEVER forget. Alone, because the other guys had all decided the weather was not suitable, or their wives had other ideas for them.... Bloody cold, miserable day, icicles after overnight rain. I'd left home on Friday afternoon, damned annoyed that I'd been deserted, but obsessed with getting up the Glencoe valley to the Maimai hut for the weekend. I was convinced that the previous few days cold weather would force the stags to roar, and there was no way you could have kept me at home! Well, maybe at gunpoint perhaps, but I'd have certainly jumped anyone who'd tried it! I'd just bought myself a new rifle for my birthday, a Winchester Model 70 lightweight 308, laminated stock, 6 power scope etc, and I was determined to do the business with it. The walk from the Summerdale Hilton to the Maimai was pleasant enough, despite the intermittent showers. I was there with barely an hour to spare before darkness set in, so after dumping my pack in the door, I set off up the ridge at the back of the hut. Just as it was getting too dark to see, a stag bellowed across the basin, about half a mile away. I roared back at him, and he responded, and slowly moved towards me, moaning and roaring as he came. The light faded all too quickly, and I withdrew before he could scent me, but eager to resume the encounter next morning. Sleep was hard to find. I was haunted by thoughts of the big cast antler we'd found a few months before, not far from where this stag had roared. It was a 6 beautiful points, and if the other side antler matched, it was a superb stag. Knuckling the sleep from my eyes, I was out of bed in a flash in response to the 5:30 alarm! A gulp of orange juice, and a chocolate bar, and on with the wet boots without hesitation today! Happy birthday to me, 3 hours walk from the truck, 2 hours drive from home! Stumbling up the hill in the dark, trying to get high above the stag before first light, happy as a sand boy! I was carrying an empty pack in readiness for the return journey, and very, very confident of success. Sometimes, after a lifetime spent hunting, you just know when its your lucky day! As it was getting light, I was up onto the well defined game trail leading up to a low pass which crosses into the next valley. The open tussock sections between strips of beech forest petered out just below the summit of the pass, where solid bush commenced. Still no sound from the stag of the previous evening... despite my repeated roars to stir him up. Entering the trees at the summit, I moved cautiously, ears alert... then, faintly, far down through the trees, a roar! I gave him a hearty bellow in return, and he responded angrily. Silence for 10 minutes, then another roar, only 100 metres away! Bloody hell, the hair on the back of my neck erect, heart pounding, I roared again, crouching in behind the base of a huge beech trees, 308 poised, eyes scanning in the direction of approach. The massive stag moaned and grumbled as he came striding into view, intent of dealing to the invader of his territory. Angling across the hillside, not directly towards me now, and I'm desperate to get a clear shot. Finally, at about 30 yards, there's enough space between the trees and the 308 blasts out at him, centered on that mighty shoulder. And down, he's mine, and now I breathe again, walking carefully forward. 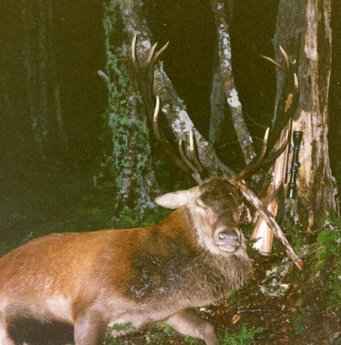 Bloody hell, just look at those antlers, and what a stag he is! 14 points, I'm shocked! What a birthday present! The walk back to the truck with the head, and 100 lbs of venison, was definitely a mission, but I smiled along every step of it! A treasured memory, which time does not erode. At the time, this stag was the best I've shot, and the antlers are still tucked in the garage, too good for knife handles, along with a 12, and several 10's. "Where the Brown Trout Die of Old Age!"